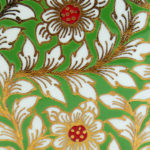 This trellis pattern, with rice motif, dates back to the reign of king rama V (1868-1910). 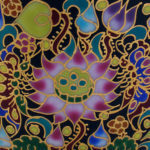 Originally reserved for royalty, was used in the palace, rice being primary crop in Thailand, This design has become an emblem for the Thai people. 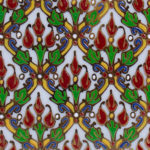 Any collector of Benjarong must include this pattern in a collection. 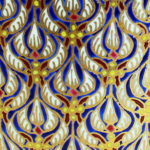 A high degree of craftsmanship is required to produce this pattern showing fluidity and delicacy. 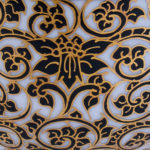 The popularity of this pattern has influenced many variations on this theme, and can be considered the base pattern of Benjarong. 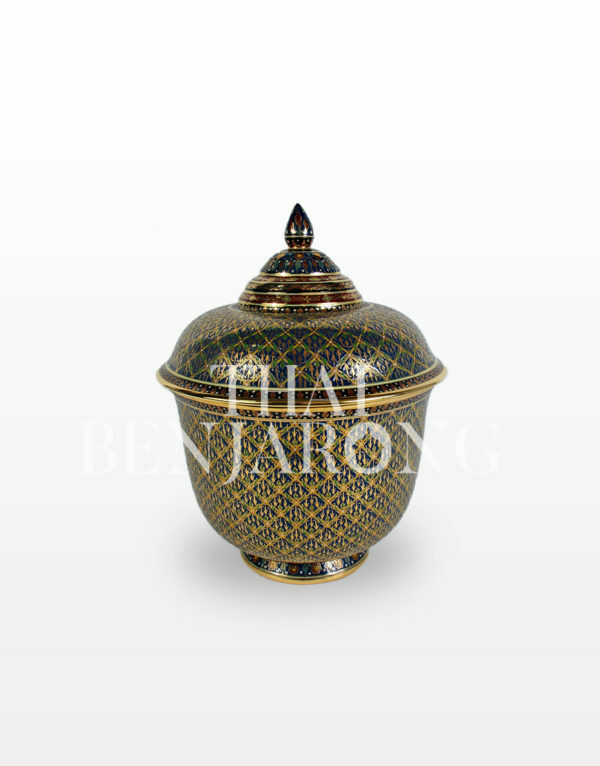 The word Phum Kao Bin is derived from two Thai words. 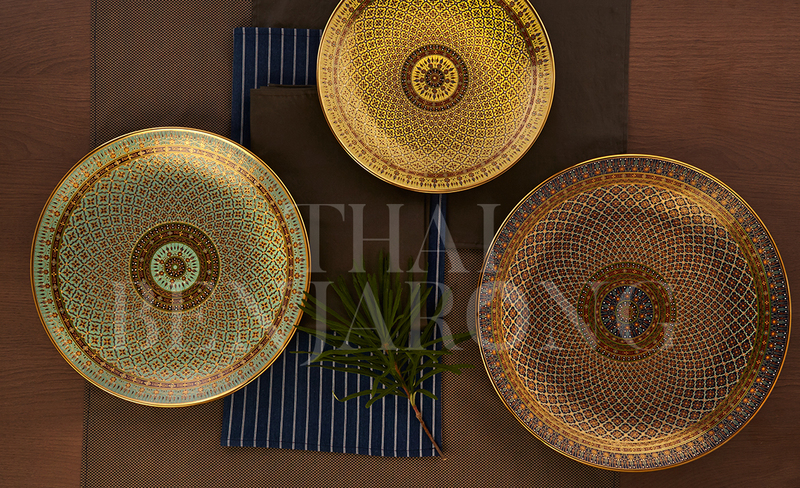 Phum refers to bush, while Khao Bin refers to a bowl with a high saucer and sharp tip similar to lotus shape. 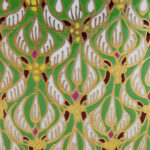 This pattern basically shows the repetition of the kite, but the detail of the pattern will be different up to the type. 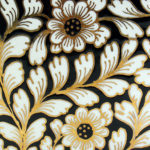 This original daisy floral design dates back to China. 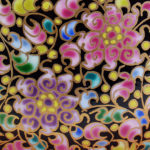 The Thai adaptation with stronger colors became popular during the reign of King Rama V and received royal permission to use the Chakri dynasty name. The rounded petals in white surround the round pollen area in red. 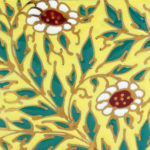 The flowers appear to float, surrounded by the background and leaves. The leaves are given a delicacy of appearing to be in motion , blown by the wind. 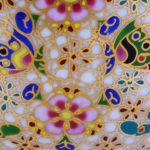 This pattern originated during the reign of King Rama II. 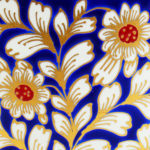 (1809-1824) Pikul is a flower symbolizing Buddhist lent. These big trees that produce these fragrant flower are often planted in temple grounds. 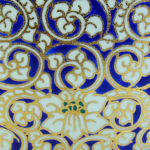 King rama II invited Chinese artists to Siam to teach his craftsmen how to draw on porcelain. 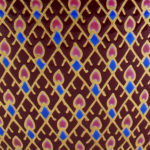 This trellised pattern, with its’ geometric shapes can often be seen decorating the walls and ceilings of Thai temples, including the grand palace and many other historical buildings. 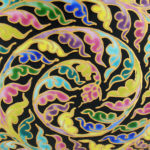 This period could be considered the birth of “Benjarong” the Thai form of “5 Color” Style of porcelain over glaze. 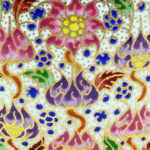 The Chinese Ming Dynasty “5 color” style had a free form painting style of flowers, butterfly, and birds, while the Thai form developed into it’s tighter geometric deigns. 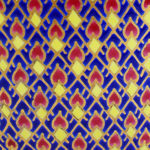 A delicate diamond pattern with a flame in the middle. This is a relatively new design , symbolizing the multi–faceted and brilliance of diamonds, with a single flame being reflected to provide light. An analogy of Buddhist thought spreading outward. 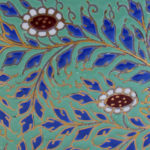 The design has an effect similar to impressionist art, where pure colors are placed next to each other and allowing the eye to blend the colors. (Example: red and yellow placed next to each other appears as orange depending on how the light is reflected, it might leak red at one part yellow in another, another , and various hues of orange) The color appears fresher and more alive. 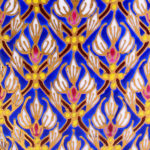 A trellis design with a dwarf orchid inside, this is an ancient design originating in the King Rama II period (1809-1824) . Early orchids were much smaller before modern large varieties were developed. 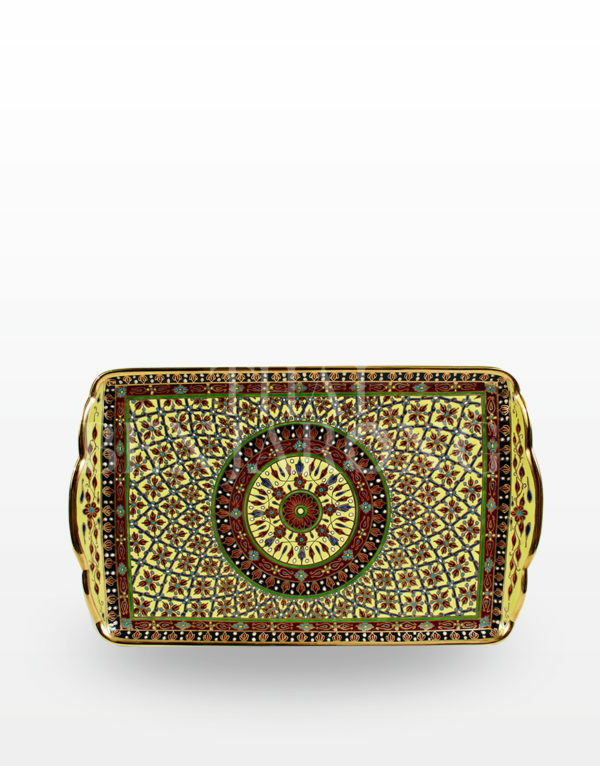 The overall design is developed to create continuous geometric pattern of lines that can spread over a large pattern. 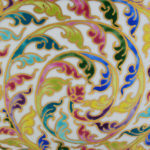 Vine and multiple color leaf pattern in swirls. 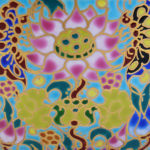 The leaves curling away from the vine is called “Kanok” this motif is used frequently in temple art. The colors of the leaves are in primary colors of blue, red, and yellow along with secondary colors of purple and green. 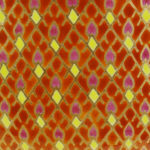 The combination of warm colors and cool colors give the design a 3 dimensional quality. The “Kanok” swirls make the leaves look like flames in the wind. 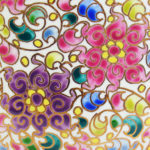 This delicate design combines flower and swirling vines, with multi color leaver .It is based on earlier Chinese Ming dynasty design that were free flowing designs, each flower petal and leaf is carefully painted to have a gradation of thin to rich coloration. 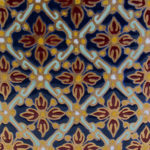 The Black background pattern has a stronger presence with the warm colors of reds pinks sum ping out, while the cooler colors of blues and greens taking a middle ground. 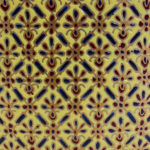 The black recedes to create a 3 dimensional design. 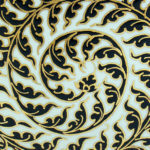 This pattern uses the llang -llang flower in a swirling pattern of vines and leaves. The llang -llang is a very fragrant flower that is used in essential oil treatments. 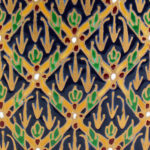 This design is a negative painting technique. The white foreground is actually unpainted, while the background of deep blue is painted the background-foreground play back and forth so your eyes focus is constantly trying to focus back and forth. 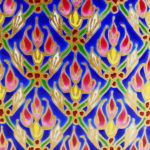 This pattern is an attempt to reproduce art in religion mainly, which this flower is a symbol of Thai flower in Buddhism and bring art from China to mix with Thai art, but drawing lines between flowers and butterflies to cause shady to eye sight. In Buddhism, the lotus is the most revered flower. It represents purity, because the flower comes out cleanly out of muddy waters, it also represents state of selflessness and nirvana which is the final stage before entering heaven. Most seated Buddha images are on a lotus base, especially in the “Touching Earth” posture when Buddha reaches down with his right hand and touches the earth with his finger tips to signify his oneness with the earth. 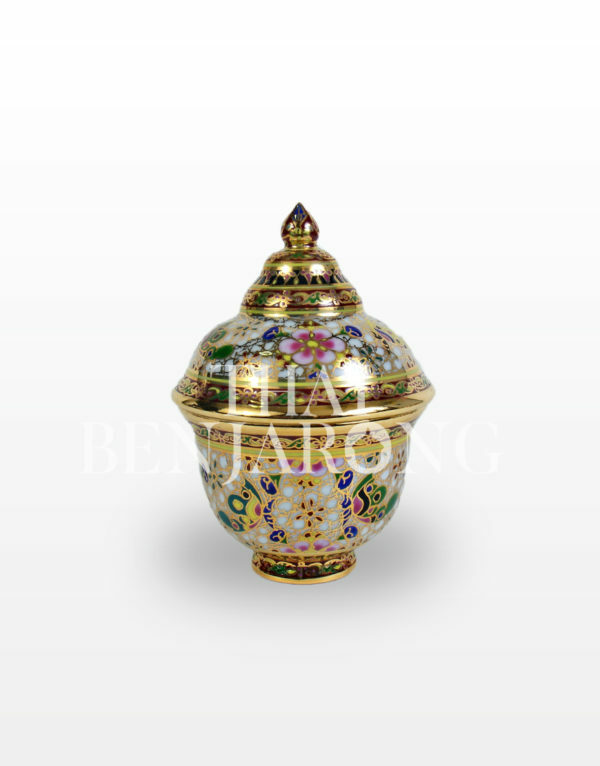 The scent of the lotus also signifies religious devotion and is helpful in meditation. 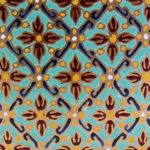 This design is influenced by the Chinese ming dynasty form of free form painting, but is a modern design produced within a single family, handed down to 7 sisters who keep the design process a secret, the golden dots on the white background will produce a pinkish glow to the background. 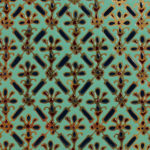 This pattern is an original Chinese Ming dynasty design. 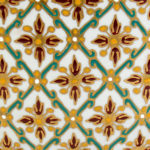 Free form butterfly and flower design on a white background of gold lines looking like broken mirror. 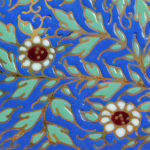 The flowers are done in a gradation of red to ping petals. 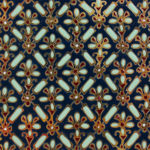 The stylized butterflies are of various colors of green, blue, yellow, and purple. 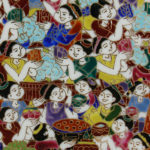 This pattern is the human figures design.One important factor of thai painting is that, like the human figures suggest the meaning of their action, these paintings are also a precious source to learn the history of Thailand. 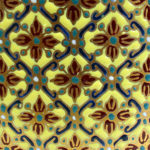 The stylized human figures are of various colors of red, green, blue, yellow, and purple. 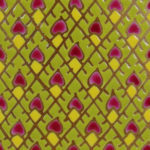 This pattern is the elephant design. 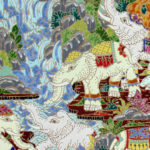 Elephants are an important part of Thai culture and the Thai way of life in the past. 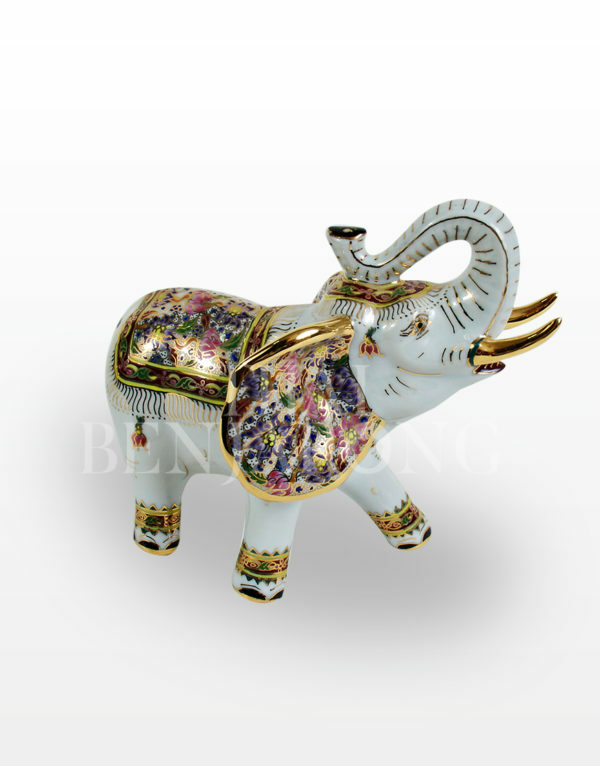 They are a traditional symbol of royal power, an essential feature of Buddhist art and architecture, an a spiritual mentor for people of all walks of life.